View Johnstown Real Estate Below – If you’re looking for a great home in a thriving community, Johnstown is the perfect fit. Located between Denver and the Fort Collins – Loveland – Greeley triangle, you have access to everything you need from recreation to shopping. Johnstown homes for sale consist of properties priced from high end luxury homes in the millions to more affordable properties for a first time buyer. Check out the listings below and don’t forget to contact me should you want to schedule you’re private showing! If you blink you might miss the emergence of the next great Northern Colorado economy. For the past several years, Johnstown has been annexing premium parcels of real estate to become a prime location along I-25 and U.S. Highway 34. Today, this unique community is positioned for rapid development. Capitalize on this opportunity today. Home prices in Johnstown are still affordable and with interest rates at all-time lows now is the time to get into this ready to boom real estate market. Big growth is everywhere in Northern Colorado. But nowhere is there more activity than all along the I-25 corridor, with Johnstown right near the center of it all. What lies ahead? Who knows, but there is great speculation that oil exploration and the ACE/NASA Project will create a huge boom in this area making Johnstown ripe for a real estate boom. The region continues to attract more and more highly-educated workers as two well know universities are nearby both in Fort Collins and Greeley. Nationwide, experts project the I-25 corridor to be among the most powerful business centers in the country. And in Johnstown, you’ll find room to grow, no matter what your business. 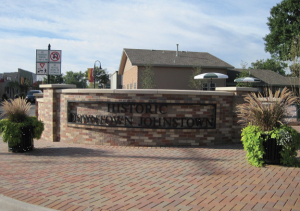 Rooted in history and rich with possibilities, Johnstown offers a central location in one of the hottest growth areas along the I-25 and U.S. Highway 34 corridors. Whether you’re looking for a noteworthy address for an office, or a high-traffic location for your next storefront, Johnstown has what you need. With a great quality of life and land to breathe Johnstown offers you a small town feel while being extremely close to large economic centers where you can do all of your shopping with only having to go a few miles to do so. Make Johnstown home!